It'd be great to see Altunenator be able to stop iTunes on a timer in addition to starting it on a timer. Leaving for work, it'd be great to know Altunenator will turn iTunes off for me after I've left. Can Amphetamine keep the computer awake when Gamepad input is being generated? It's frustrating that Mac OS X doesn't consider gamepad input when starting screensavers or sleeping. I know it's a little out of scope, but could Amphetamine handle this? Preventing the mac from sleeping during games is my main use case for this app. I don’t plan on trying to implement this function specifically – BUT – in v2.3 (currently awaiting review by Apple) there is a new App Triggers option. 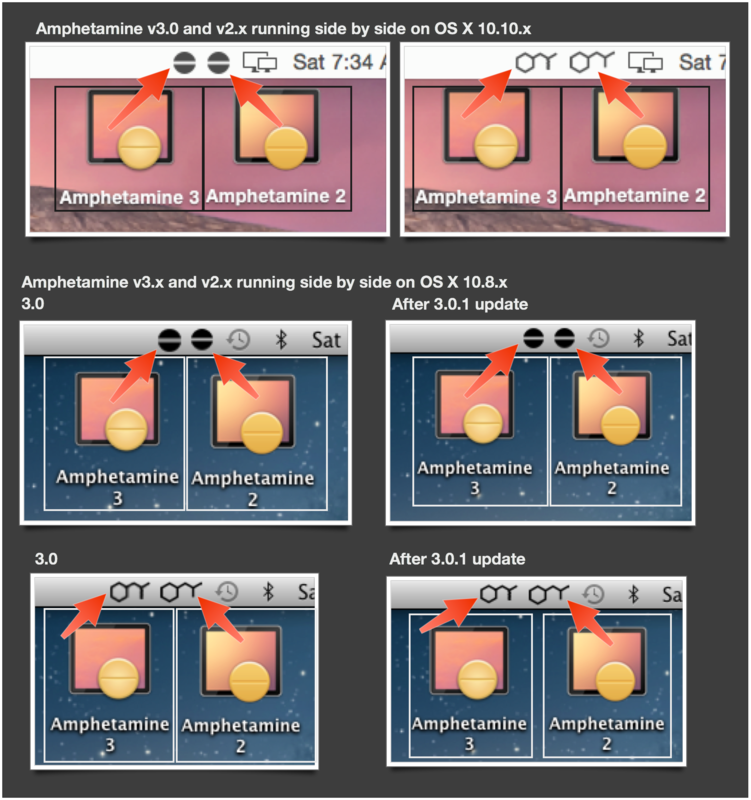 Essentially, Amphetamine will keep your Mac awake if specific apps you identify are running. Might work for you, unless you leave your emulator/Steam client/etc. running all the time. I'd love to see the option in Amphetamine to keep the icon as the same horizontal pill and just have the icon dimmed for off and "lit" or full for on. So the shape and orientation stays the same, but it's greyed out for off and black for on. I have several folders with lots of items, several thousands. Would it be possible to "pre-load" them in the background? That way the Finder can display them instantly. I am thinking to something like "ls /Volumes/HDx/folder-a/ > null"
I would say a big competitor of this app is KeepingYouAwake. It is a github project so is not on the MAS but has the same underlying functionality, utilizing the caffeinate command (and it was also developed because caffeine development was stopped). You would have to look more into this, but just running basic numbers from having both apps running through activity monitor KeepingYouAwake was doing about 5.0MB of memory while amphetamine was at about 7.3MB. Using the preferences window added more to that obviously. I know optimization is usually the last and potentially the most time-consuming step but it may be something you want to look into, maybe even looking into what KeepingYouAwake is doing with their code. Thanks! Menu item "Sleep now > HD-list"
Possible Bug: Pill - Full/Empty style is also Vertical/Horizontal (unlike the previous version). Have you thought to manage the magic mouse. I would like to stop quickly the mouse scrolling. Something opposite in Amphetamine: option to Turn off / Sleep system after defined period of time. When I listen to the music late night it would be great to put to sleep my mac after lets say 1h. Normally when I'm listening from iTunes it's playing till battery says "good night". Sorry, but I am not bringing back the legacy molecule icon. I’ll try to get a png based version that can be used as a custom icon posted though.